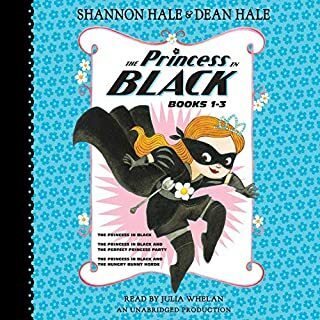 Would you consider the audio edition of The Princess in Black, Books 1-3 to be better than the print version? The print version is much better. The illustrations in the print book are adorable and add an extra element of fun to the story. My daughter is so obsessed with the books that I downloaded the audio version for her to listen to in the car when I can't read to her. Princess Magnolia/The Princess in Black is an amazing. I like that she is strong and tough but also sweet and polite. Before she fights the monsters, she asks politely for them to return to monster land. The narrator of this audio book really detracts from the listening experience. She speaks in a sleepy, slightly raspy monotone and doesn't capture any of the excitement or charm of the story. I would have liked a more enthusiastic reader. Maybe Ms. Whelan was trying to sound soft because this might be a bedtime story, but I wish she'd tried to sound more engaging. The print version does make me (and my daughter) laugh. She also gasps and gets extremely excited.